I have often found it striking that of the four Oboe Concertos which are arguably the best and the most frequently performed, three - those by Ralph Vaughan Williams, Richard Strauss and Bohuslav Martinu - were composed within just over a decade in the middle of the last century. Each of the three was inspired by a different soloist; each is unique in style and orchestration, in the oboe writing and in the deployment of the soloist’s part; and in a wider context - rather concealed the cases of the Martinu and Vaughan Williams - they all take on an importance beyond that of a vehicle for oboistic virtuosity. The Vaughan Williams Concerto is surely one of the finest for our instrument, and in its Finale it expresses a symphonic gravitas which is rarely found in concerti for our instrument. Inspired by the legendary Liverpool-born Leon Goossens, the Vaughan Williams is not only a fine concerto for the instrument, it is a skilfully crafted and inspired work which has perhaps too widely been regarded as no more than a pastoral stroll for a specialised woodwind following. Some years ago I made a translation of the an article entitled Observations on Form and Thematic Sources by Andreas Friesenhagen, probably the first study of the Vaughan Williams Concerto by a non-English musicologist. Herr Friesenhagen shows how the Oboe Concerto conceals a musical individuality unique among Vaughan Williams’ oeuvre, by drawing upon the Gregorian St.Mary-antiphon Salve Regina Mater, sourced from the Vesperale Romanum. The Gregorian source was used by Vaughan Williams on only one other occasion, in the Five Mystical Songs, and it gives to this work a more philosophical and inward-looking cast of mind than is at first apparent. I will try to show later in this article that the spiritual and philosophical mind-set goes further still to the core of the work. The author then goes on to provide the key to following the concerto’s structure anew: the central movement forms a simple dancing interlude between the outer movements, which seem at first to be very different but are in fact quite closely related, both in form, scale and thematic material. Friesenhagen demonstrates that they share a common ABA ground plan, which, linked to their organic melodic growth gives the work a cyclical nature. In this article I would like to share my own researches on the music of the concerto, to correct some errors, and also to offer some practical observations gained from many years of studying and performing it. I should point out that I have revised a few of my own ideas since I made my EMI recording in 1990, especially on the tempo relationships and some expressive nuances, so some of what I write here may be in contradiction to that performance. Recordings are after all only a picture of a performance at a particular time, and it is a condition of artistic life that we constantly learn as we go. The Oboe Concerto was composed during 1944, the closing years of World War 2. 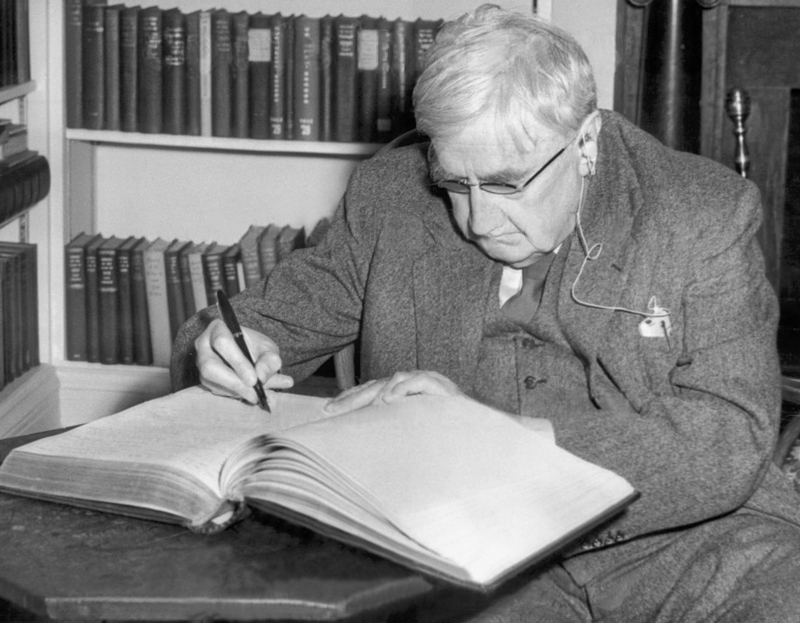 Vaughan Williams was the aged 72, and at the time he was engaged upon the composition of his opera The Pilgrim’s Progress, which was eventually staged in 1951 and incorporates most of his earlier work, The Shepherds of the Delectable Mountains (1922). The Fifth Symphony in D, one of the composer’s finest pieces was composed just prior to the Oboe Concerto, and in it Vaughan Williams used a number of themes from The Pilgrim’s Progress. While he may not have intended the associations which these themes carry in the opera to be transposed into the Symphony, it seems to me that composers recycle their ideas for many reasons, one of which may be to work out feelings or moods that they are preoccupied with in their own personal way. Certainly when the Fifth Symphony was first heard, conducted by the composer in June 1943 it was warmly received and was widely regarded as having a valedictory quality, of being perhaps a last will and testament. This was far from the case as was proved by VW’s following works, notably the apocalyptic Sixth Symphony five years later, and maybe Vaughan Williams wanted to offer a nation embroiled in the depths of a severe conflict a vision of a more peaceful and transformed future. At one stage he penned a quotation from Bunyan’s Pilgrim’s Progress at the head of the third movement of the Symphony, but later discarded it to avoid too strong an attribution. When Vaughan Williams turned to the composition of the Oboe Concerto he drew upon music discarded from the Scherzo of the Fifth Symphony for the Finale: Scherzo of the concerto. The link is, I confess, a little tentative, in that the scherzo of the Fifth is the movement least connected to Pilgrim, but there remains a distinct emotional and philosophical identification between the works. This is the main reason why the Finale became musically the strongest movement of the work: this is unusual in concerto form where the opening movement is more often the most powerful, but not so unusual for a symphony. It also explains why the music of the Finale possesses the symphonic weight I referred to earlier. The Oboe Concerto is unusual in that there is no separate slow movement, although there are slower and more spacious episodes in the outer movements which balance the work. The central Minuet & Musette, which has the nature of a brief and quite inconclusive interlude, proceeds uninterrupted in its flow. Note also that VW has asked for full strings but generally skilfully reduces their number when the oboe is playing, so the body of sound available is rich and variable. There are a few moments where the full strings enter with the soloist, and in these the soloist needs to achieve maximum projection. This is not an error on VW’s part: this treatment is demanded by the climactic nature of these moments (e.g. 3 & 4 bars after E, First movement). The first movement has an elegiac mood at times, but the tempo marking is quite clear: Allegro moderato mm.88. There will always be an endless debate about metronome marks, suffice to say that I regard Vaughan Williams’ suggestions for this work to be extraordinarily apposite; if observed accurately they unmistakably reveal the style and character of each movement. The Rondo is certainly reflective but contains moments of high power: after a gentle beginning, in which the main theme is discreetly, almost neutrally intoned, the music almost inevitably gives way to the first cadenza. We need to play these passages with the same mercurial lightness and rapidity that great violinists bring to the similar passages in The Lark Ascending. Much care is needed to achieve the rhythmic and technical lightness, and in emerging from the cadenzas we need to be keenly aware of the continuing rhythmic figurations in the strings to achieve a seamless transition. After these passages the music builds toward the most emotional statements of the Salve Regina theme, the later ones quite triumphant, if somewhat fleeting. The apparently jaunty melody of the B section carries the curious marking cantabile. Playing much orchestral music by VW in the orchestra, including recording the cycle of his nine symphonies twice in the course of my career, with Vernon Handley and recently with Andrew Manze, has been very revealing in learning the composer’s style. VW often writes cantabile over a phrase, but the sense of his meaning seems to be that “this is important – bring it out” as much as our usual understanding to play in a singing style. “Sing out” seems an appropriate translation here. That said, it is not an unreasonable approach to clip these phrases and treat this passage as a bucolic jolly “English” tune. A different and more subtle character is revealed if we apply VW’s cantabile: try playing this melody more sostenuto and legato, with gentle articulation until the printed staccato dots appear. Note that there is no change of tempo marked by the composer here, but a gradual step-up, say to about mm.96 at the latest by letter D does seem to work well. The passage following letter D has the sense of a development, with some deeper moments and should not be hurried: the staccato passagework should be brought out very clearly and the high phrase endings strongly projected. There is much here to warrant careful attention. Following the climax and tutti string entry the music should return to mm.88 for the passage from letter F, and this should again be achieved seamlessly and without an obvious ritardando. For me, an important way-marker in this work comes in the latter half of the Rondo Pastorale, 5 bars before G, where the music seems momentarily to hold its breath, and the oboe enters, hovering on a softly-intoned G before reinvigorating the melody once more. The key here is to slow the music down steeply toward the end of the bar before the tranquillo is marked, and to give the first beat string chord plenty of time to register in the listeners’ mind before entering, with as soft and silver-toned a G as can be achieved. The same thing recurs at the close of the movement at letter L. The cadenza has died away in a murmuring improvisation, at the end of which one should encourage accompanist or conductor to sustain a clear silence before sounding the next chord. We can then place our last phrase with as much space and tranquillity as acoustic and mood demand, being sure to return to crotchet=88 where VW marks Tempo. This also informs the pacing of the same phrase the first time round, but on a less spacious scale. A breath before the final E is musically satisfying. The cadenza at Letter K is the climax of the movement, and I regard the soloist’s diminuendo to be marked far too soon. It is as if you reach the summit of a mountain and turn to leave immediately without taking in the view! I sustain the forte (fortissimo!) until the third A is reached, 7 beats later and then make a very rapid dim. Corresponding balance should be sought in the second phrase of the cadenza. The Minuet and Musette is much more straightforward and largely speaks for itself. The tempo mm=64, is very interesting in that it is neither slow nor fast, and if observed gives a weight to the crotchets and demands a firmer staccato style to the quavers, so that they may not be too light and inconsequential. Note that there are very few notes indeed which do not have an articulation mark. VW knew how he wanted this played! I like to point out the double meaning of the Musette found in the title. An 18th century dance form related to the minuet, it is often associated with the French bagpipes of the same name. This is characterised by the sustained low notes in the oboe which underpin singing and punctuated string writing. Make the most of the stubbornness of the long notes in the solo line, they need not be too nicely expressive, and the fp markings are important. Two bars before E I like to make another fp (not written by the composer) and a big crescendo on the trill leading to the climax. It is worth noting that the statement of the first few bars of the main theme six bars after G is the only time it occurs forte, or legato. At the close the music is left hanging hesitantly in the air, helped by the second inversion chord implied in the last two bars. The pause should be quite short, without any need to round off the chord, and the finale may begin attacca. * Oboe Concerto, Finale bars 10-13, Oboe. * 5th Symphony Scherzo fig. 2, flutes/violins. * Oboe Concerto, Finale bars 13-23, violas. * 5th Symphony Scherzo bars 8-16, violas. * Oboe Concerto, Finale letter A, Oboe. * Oboe Concerto, Finale letter D, Oboe. * 5th Symphony Scherzo 7 bars before fig.4. This becomes more lyrical until it is joyfully interrupted by a powerful string theme. A reflective moment follows where a beautiful and unmistakable Vaughan Williams melody is briefly heard: an incomplete premonition of the glorious 3/2 melody which will dominate the closing pages of the score. The forward motion continues, but in a more angular style, which I think of as the machine breaking down until the strings are suddenly torn off leaving the oboe soloist to run on until also out of steam. When no further movement seems possible, a last rising phrase heralds the opening of a new scene with gloriously-spaced B minor 7th chords in the strings. I make a clear break here (interrupting the composer’s phrase mark) before the rising phrase, as the brief silence clears the mind of audience and performers, and gives the onset of the chordal passage more impact. Compare this with the famous sequence of (quiet) string chords at the start of the third movement of the Fifth Symphony. At this point it is worth comparing the relative speeds and note values of the various passages of the movement. When I first studied this concerto I felt that the Doppio piu lento marking (crotchet = minim) between M and O was too fast for this material, similarly the Lento (crotchet = dotted minim) after V felt too slow, and indeed if we observe the latter accurately it is certainly very spacious. I have later come to consider however that these markings are absolutely correct, because they equate the note values and speeds in an organic and very symphonic way, and give the music a subconscious sense of unity, and also inform the expressive qualities of the melodies. I have devised the following chart to show this. If we look down the column beginning in short bars 11-12 we see that there are four different sets of note values, from different passages in the movement, which are exactly the same in speed. In the contemplative Doppio piu lento section Vaughan Williams asks for maximum lyricism and eloquence from the soloist. A lush climax of cello melody leaves the soloist again intoning a lonely phrase, and the Presto returns briefly before the Concerto’s spiritual kernel is finally revealed. The expansive 3/2 melody hinted at earlier in the movement is now expounded in its full glory. The slow coda is indeed introspective, but there are no recollections from earlier movements of which I am aware: the flavour of the music is indeed similar, since all the themes are splintered off the Salve Regina as demonstrated in Friesenhagen’s analysis. The use of the epithet “unknown regions” by Day is - intended or not - appropriate: Toward The Unknown Region was VW’s setting, composed in 1905 (revised 1918) of the poem by Walt Whitman, whose often spiritual writings were a constant source of inspiration to him and upon which he drew extensively in the Sea Symphony (1910) and Dona Nobis Pacem (1936). The Unknown Region is a longed-for Utopian realm, the search for another form of which informs the Fifth Symphony and of course The Pilgrim’s Progress. This long-breathed and soaring melody, in the company of some of the most powerful string scoring in the work2, is the most strivingly expressive passage in a composition whose source theme is, as we have seen, a Gregorian incantation. The true coda is of course the rapid quaver passage which draws upon the scherzo and concludes the work with, yes, the rising five-note phrase which began it. This present considerable challenges for the soloist, but which can be liberatingly overcome with fluent and light tonguing, whether single or double. To conclude that the closing pages of one of the greatest concertos for our instrument bear witness to a journey of the spirit which informs Vaughan Williams’s contemporaneous compositions, with a distinctive character provided by the solo instrument’s voice, seems to me to be inescapable. Some corrections have been made by the publishers OUP over the years, but as many players (including me) have older copies I will list all the corrections of which I am aware. 1) 2 before letter A and 2 before letter K: the soloist’s trills: these passages should be as printed the first time. The first trill is F# to G# with turn E-F#, the second A-B with turn G natural-A, and the third B-C with turn A-B. A case can be made for the second turn being F# to A, but certainly not as it appears 2 before K in the published copy and score, with G natural in the first trill etc. I suspect this error has occurred by the incorrect placing of the sharp sign. Musically and harmonically these passages are identical, the only difference being that there should be no final turn in the bar before K, since it is followed by a caesura in the solo part. 4) 1 after letter B, third beat, the last triplet should be B, not A (as the next time in the 3rd bar of B). 5) Letter F, phrasing. The phrase lines should lift after the first beat of the second bar, and the same in the 4th bar. This is correct in the mini score, but not in the solo part. 7) Letter L is missing from the solo part; it is at the start of the second line up from the bottom of the page. 8) Bar 9 (score only): first beat shows an F in the oboe part, which should be a G.
9) 8 before O (second violin part only), there is an A# instead of G#. This does not appear in the score or piano reduction, but can introduce doubt in rehearsal as it sounds quite plausible! 10) 3 before Q, oboe part last beat. Without sight of the manuscript I cannot be sure that this is a misprint, but I am convinced it is not musically correct. The music here takes in a phrase shape very clearly identified with VW, namely the falling three note phrase of a tone or semitone, followed by a minor third, e.g. C-B flat, G (9 & 8 before P). This forms one of the seeds of his dramatic Fourth Symphony, for example. Here it often appears as the second part of a two-bar phrase, such as 7 & 6 before P, C-D-F-E flat-C. A partner phrase first appears 2 before O in the second violins, D-E flat–F–E flat-D, and in inversion, which always moves step-wise. Where there is a rising third there is a corresponding falling third; where there is step-wise movement there is no third. For this reason I believe the last note of the 3rd bar before Q should be a B flat, not A flat. This is reinforced by the accompanying inversion in the viola part, which moves step-wise. By playing B flat we also add musical tension in the rising seventh to the A flat in the next bar, as we approach the climax of the passage. 2 - Contrast this with James Day’s comment about the strings “nodding sagely in agreement whenever the soloist says anything particularly wise”). Lady Evelyn Barbirolli, Vernon Handley, Michael Winfield, Douglas Bostock, Piotr Gajewski, Edward Warren.